Jody Stephens performing with Chris Stamey. A few weeks ago, I found myself, as I occasionally do, going through a period of despair, to the point where I even decided to damn the torpedoes and reach out to friends on Facebook to see what kind of surprises might be in store there that just maybe might help. My college roommate, who now lives 3,500 miles away from me and who I have not seen in years but probably knows me better than most people, made the following suggestion: listen to the album Big Star’s Sister Lovers. “It can’t hurt,” she said, “and it will probably help.” As always, she was right. Take care, please, take care. 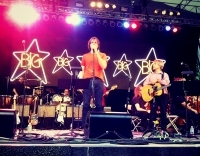 For those of you unfamiliar with Big Star, the short version of their story is that band originated in the early 1970s, with founding members Chris Bell, Alex Chilton, Andy Hummel, and Jody Stephens. They released their first record (#1 Record) in 1972 and their second record (Radio City) in 1974. Their third, Sister Lovers, was released in 1978. All received critical praise but no commercial success. But what drew a new audience to Big Star were the huge numbers of musicians, who starting in the 1980s, spoke repeatedly about how profoundly this music influenced and inspired their own work. I counted Alex Chilton, a guiding voice of the band, among my friends up until his tragic death at age 59 in 2010. In his obituary for Chilton, Dave Itzkoff of The New York Times wrote that Chilton, “left a legacy more easily measured in artistic influence than in commercial impact.” Chris Bell had died in 1978, and Andy Hummel passed away just months after Chilton. Since 2010, I have found it extremely difficult to listen to Alex Chilton’s music, with Big Star as well as his numerous other projects and collaborations. It reminded me so painful of the finitude of our existence—the existential given of death with which we all grapple, sometimes more skillfully than others. But on a hot summer night in Central Park, I immersed myself into the experience of an outdoor concert entitled, “Big Star’s Third: An Orchestrated Performance of the Legendary Album.” Organized by Chris Stamey, probably best known for his work with the indie band the dBs, this show brought together some legendary musicians from the American independent rock scene, along with a 20-piece chamber orchestra, and most especially Jody Stephens, the only living original member of Big Star. At one point during the show, Mike Mills, the bassist who formerly played with R.E.M., told the crowd that even though we may have lost (three of the four) artists who created this, the art lives on after them. At the Central Park Summerstage, there was such exquisite beauty as the musicians collaborated to not just render these songs faithfully but also to also bring them even more alive—to bring out the spirit and energy in them—creating something richer and fuller, while still remaining steadfast and true. This was not a tribute band, playing old songs to capitalize on some now at best kitschy glory days. This was about finding the eternal—how the music of Big Star will live on. Chilton and company probably never realized how great a gift they were leaving future generations. They will be missed, but I for one am grateful that they have inspired so many artists to carry on the legacy. Who made this all so probable. May, R. (1985). My quest for beauty. San Francisco, CA: Saybrook Publishing.